ESA still awaits a signal from its ExoMars Schiaparelli module, which was expected to land on Mars at 10:48 a.m. EDT (14:48 GMT) on Wednesday, Oct. 19. Contact with the spacecraft was lost about a minute before the planned touchdown on the Martian surface. The Entry, Descent and Landing Demonstrator Module (EDM), known as “Schiaparelli”, is part of the joint ESA-Roscosmos ExoMars 2016 mission tasked with searching for traces of life on the Red Planet. The EDM itself was designed to demonstrate the capability to perform a controlled landing on Mars. After a seven-month trip, Schiaparelli arrived at Mars while attached to ExoMars Trace Gas Orbiter (TGO). It was separated from the orbiter on Oct. 16 to begin its three-day cruise ending with landing on Meridiani Planum. The controllers woke up the module from hibernation about one hour and 20 minutes before the planned touchdown. The lander was activated at an altitude of about 76 miles (122.5 kilometers). Initial data, provided by the Giant Metrewave Radio Telescope (GMRT) in India and ESA’s Mars Express orbiter, indicated that the module had successfully completed most of the steps of its six-minute long descent through the Martian atmosphere. Schiaparelli made use of its aerodynamic heat shield during the atmospheric entry and deployed its parachute when approximately 7 miles (11 kilometers) above the surface. The lander’s liquid propulsion system was activated to reduce the speed to less than 4.35 mph (7 km/h) when it was about 6.5 feet (2 meters) above the ground. The engines were expected to be switched off and the module was planned to be dropped to the ground. However, the transmission sent by the GMRT and Mars Express stopped shortly before the module was expected to touchdown on the surface. 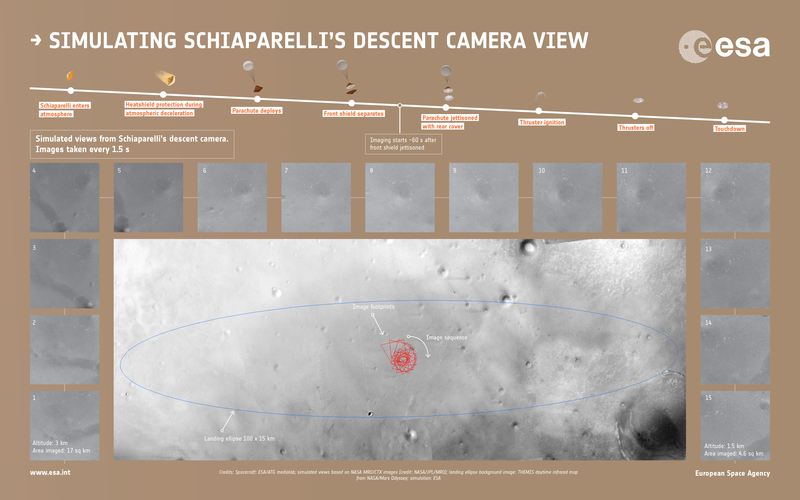 ESA revealed that an important set of data about the descent of Schiaparelli was obtained by the TGO, which was being inserted into Martian orbit at the time of the module’s landing. 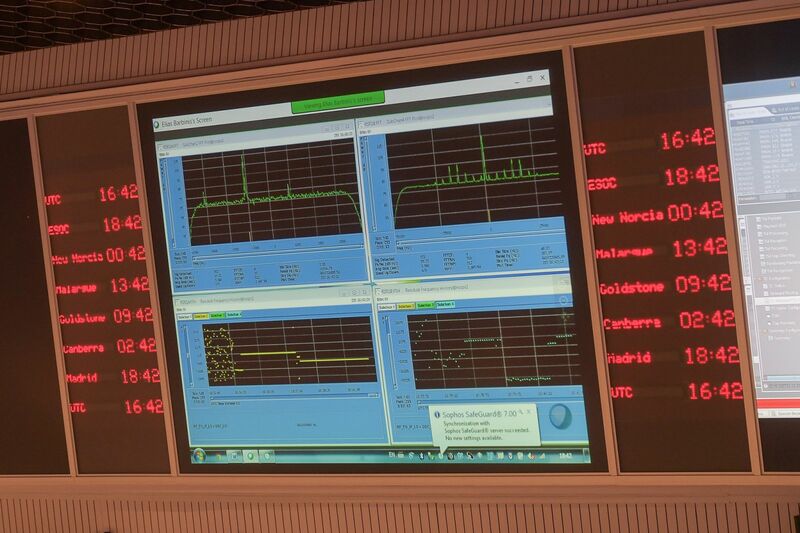 The detailed telemetry recorded by the TGO is currently being analyzed by the mission team. Parker was addressing reporters during a press conference convened today, Oct. 20, at 4:00 a.m. EDT (08:00 GMT) to provide an update on the status of the mission. He noted that the controllers received extremely valuable data to work with and the agency will have an inquiry board to dig deeper into the available information. While the cause of the apparent Schiaparelli descent failure in now under assessment, ESA officials have provided some hints on what could have triggered the lander’s lengthening silence. They revealed that this anomaly may have been due to a premature ejection of the back heat shield and parachute. “This ejection itself appears to have occurred earlier than expected, but [the] analysis is not yet complete,” ESA said in a press release. The team will keep listening for any signals from the Schiaparelli lander, using GMRT and a fleet of NASA and ESA spacecraft currently orbiting Mars. So far, NASA’s Mars Reconnaissance Orbiter has detected no signal from the stranded module, but it will be employed to obtain images of the lander in the coming days. The Schiaparelli lander, built by Thales Alenia Space, is about 5.4 feet (1.65 meters) in diameter and 5.9 feet (1.8 meters) high and has a mass of 1,322 lbs (600 kg). It is designed to be capable of landing on a terrain with rocks as high as 1.3 feet (0.4 meters) and slopes as steep as 12.5 degrees. It was planned to be operational for up to eight Martian days after landing. Schiaparelli was designed to demonstrate the capability of ESA to perform a controlled landing on Mars. It was also expected to deliver a science package that will operate on the surface of the Red Planet for a short duration after landing, planned to last approximately from two to four Martian days. The landing of Schiaparelli is the second European attempt to land on Mars after the Beagle 2 spacecraft failed to accomplish on Dec. 25, 2003. No contact was received at the expected time of landing on Mars, and ESA declared the mission lost in February 2004. Meanwhile, the ExoMars’ TGO spacecraft is currently in excellent health after completing the Mars Orbit Insertion (MOI) maneuver at 11:24 a.m. EDT (15:24 GMT) on Oct. 19. Weighing about 4.3 metric tons, the car-sized TGO spacecraft has dimensions of 11.5 ft × 6.5 ft × 6.5 ft (3.5 m × 2 m × 2 m) with solar wings spanning 57.4 feet (17.5 meters) and providing up to 2,000 W of power. The TGO is equipped with four scientific instruments for the detection of trace gases: Nadir and Occultation for MArs Discovery (NOMAD), Atmospheric Chemistry Suite (ACS), Colour and Stereo Surface Imaging System (CaSSIS), and Fine Resolution Epithermal Neutron Detector (FREND). Although TGO’s main goal is to detect a wide range of atmospheric trace gases, it will also serve as a data relay center for sending commands to the ExoMars 2020 rover and downloading data to Earth through the ESA space communications network. The ExoMars 2020 mission will include an ESA carrier module as well as a Russian lander that will deploy a rover to Mars’ surface. The stack will be launched atop a Russian Proton-M booster from the Baikonur Cosmodrome located in Kazakhstan. If i see the photos , the rotation is counterclockwise and not clockwise and the rpm is 2 rpm .